"The heating has been completed and turned on at the Davis House. This has allowed the “volunteers” from the Sheriff’s Labor Assistance Program (SLAP) to get a lot accomplished last week. They were there for three days. 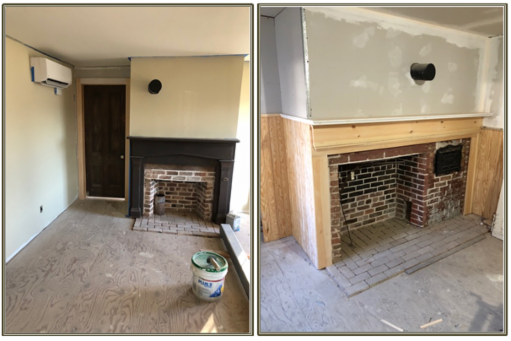 We have been spackling, painting and doing some trim work. 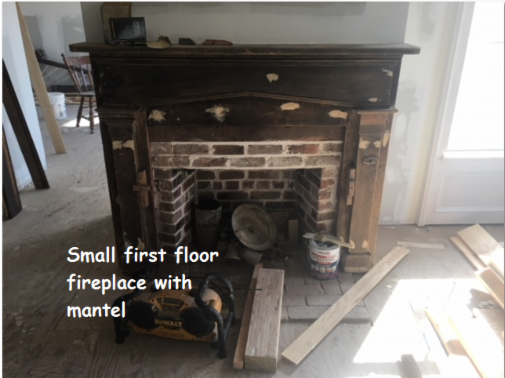 We finished the mantel in the dining room, and built a new one in the old kitchen. 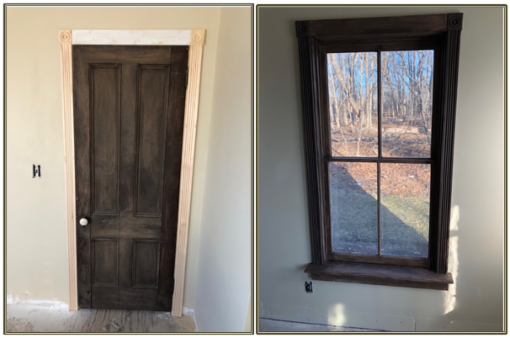 We also re-hung one of the exterior doors that was not set in place." 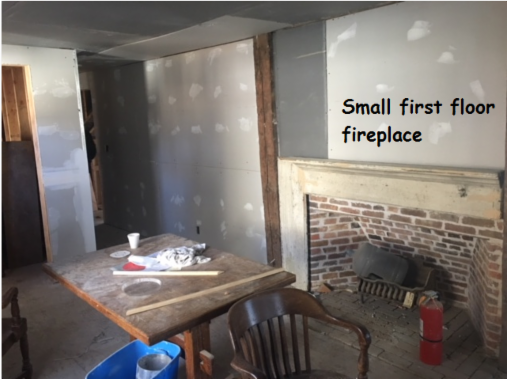 2nd FL: More fireplaces and lath work awaiting the plasterer! 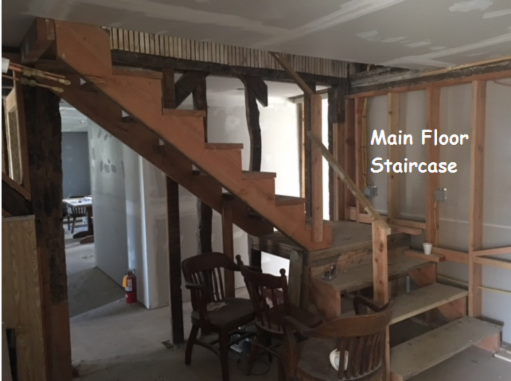 That staircase is right behind the main front door and leads up to the second floor area. Quite the steep climb! 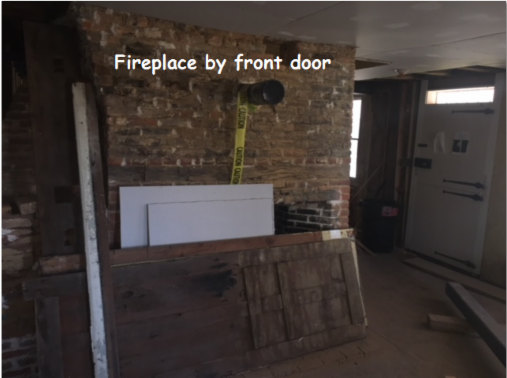 The recessed cabinet on the left is in a small alcove in the old kitchen next to the fire place with the beehive oven. 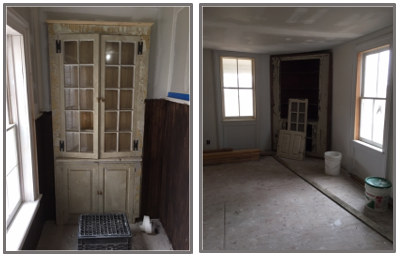 In the right side picture is a beautiful corner curio cabinet. 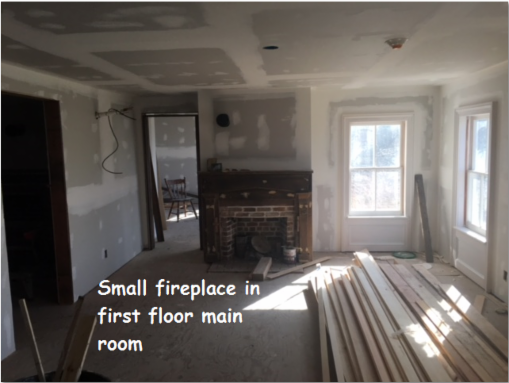 The picture on the right is of the new kitchen area. 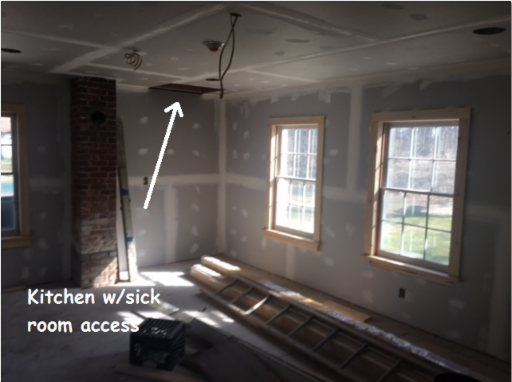 That hole in the ceiling will have a staircase/ladder leading up to what was the "sick room" for those suffering with any illness that was contagious! Old school Isolation Therapy! 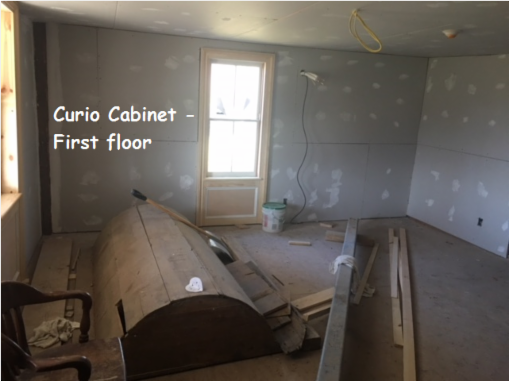 The next three major efforts to be accomplished will be the installation of the septic system, plastering of the walls on the second floor, and the building of a new, main staircase. Meanwhile, the carpentry and painting continues... These three major accomplishments are significantly expensive and we are grateful for the ongoing assistance from our Brookhaven Parks Department Commissioner Ed Morris and Supervisor Ed Romaine. A special nod to Suffolk County Sheriff Errol Toulon, Jr. for the hardworking and talented craftsmen from the Sheriff's Labor Assistance Program. Extra special thanks goes to our Board of Directors member Bob Kessler (also president of the Yaphank Historical Society) for his invaluable expertise, guidance, hard work and passion for history without which this project would not be getting accomplished! Please check our Calendar of Events for our monthly meetings and presentations as well as our fundraising events such as our annual Victorian Tea Party in May and our Yard Sale & Craft Fair in September featuring historical reenactments by the 3rd NY Regiment LI Companies 1775! Most importantly, become part of this reclamation of history project by joining with us! Click on our Membership tab and help us preserve history! Preservation Long Island is a 501 c3 not-for-profit organization committed to working with Long Islanders to protect, preserve, and celebrate our cultural heritage through advocacy, education, and the stewardship of historic sites and collections. 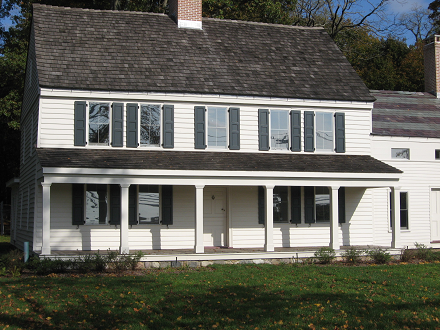 Preservation Long Island was founded in 1948 as the Society for the Preservation of Long Island Antiquities in response to the intense post-World War II development. 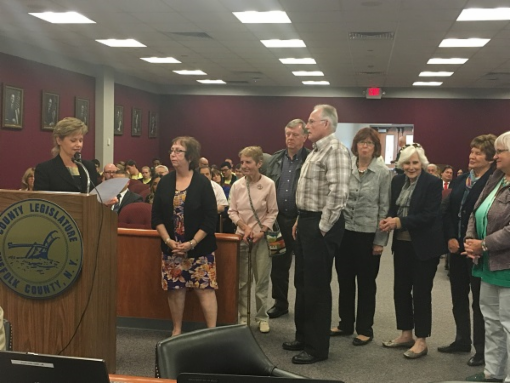 On Saturday, April 7th, members of the Davis family, representatives of our state and local government along with members of the Davis Town Meeting House Society and other local residents paid tribute to Jean & Lester H. Davis III whom passed away in 2017. Lester H. Davis III was the last Davis to grow up in the Davis Homestead; now a Brookhaven Town Landmark and which is on the National Register of Historic Places. L-R: TOB Councilman Michael Loguercio, Randall R. Davis, Lee Davis, Whitney Davis, Maryanne Douglas (president of the Davis Town Meeting House Society), NYS Assemblyman Steve Englebright, and Brookhaven Supervisor Ed Romaine. Randy Davis delighting those in attendance with stories of his life in Coram at the Davis Homestead as the oldest son of Jean and Lester H. Davis II. The first granddaughter of Randy Davis joins the group of honored speakers! What a wonderful Day of Remembrance and Celebration it was as so many people turned out to honor the lives of Jean and Lester H. Davis III! 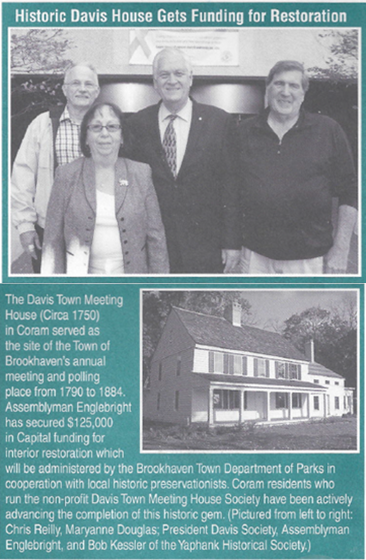 Soon, through the hard work of many people and New York State, Suffolk County and the Town of Brookhaven, the historic Coram home of Lester H. Davis III will stand in lasting tribute to one of the founding families of Brookhaven! The Davis Town Meeting House Society is sad to announce the passing of Lester H. Davis, III on December 9, 2017. Mr. Davis was the last member of the Davis family to be raised and live his life in the historic Lester H. Davis House in Coram. He was predeceased by his wife Jean Doughty Davis on July 6, 2017. Lester Hopkins Davis, III died on December 9, 2017, in Cartersville, Georgia. He was 91 years old. Lester will always be remembered for his honesty, fair dealings in business, care for family and friends, and great interest in and affection for aviation. Born to Alma (Quackenbush) Davis and Judge Lester H. Davis, II in 1926 in Patchogue, Long Island, NY, Lester was the youngest of two children. Lester’s brother John A.Q. Davis preceded him in death. Lester was the last person to be raised and spend his childhood in the Lester H. Davis House, which was the Meeting House for the Town of Brookhaven, New York, for about 100 years starting in 1780. Lester’s direct ancestors on Long Island date to their first appearance in Southampton in the 1640s, after emigrating from Wales. Lester attended Cornell Agricultural School in Ithaca, NY, and then returned to the family farm in the rural community of Coram, Long Island. He married Jean Mary Doughty in 1950, and she became a valuable partner in the operation of the farm and his lifelong wife until her death in July, 2017. Together they ran the farm, milking as many as 130 dairy cows (using modern equipment) and growing sweet corn, strawberries, pumpkins and tomatoes. In the winter, they sold firewood. It was on the family farm that Lester and Jean raised their three sons and engaged in an abundant family life filled with farm activities, tractors, trucks and airplanes. Lester learned to fly in the mid-1940s and built an airfield on the farm, which he then operated for about 30 years (Coram Airpark). Lester owned a small Piper Vagabond airplane and a twin-engine Piper Apache airplane, which he kept on and flew off of the farm airstrip. He saw to it that his three sons all learned to fly on the family farm. Lester was always known as a competent and careful pilot, as well as a strong supporter of aviation on Long Island and throughout the USA. In 2012, the Federal Aviation Administration presented Lester with its coveted Wright Brothers Master Pilot Award. According to the FAA, this is the most prestigious award that it issues to certificated pilots, “…to recognize individuals who have exhibited professionalism, skill, and aviation expertise for at least 50 years while piloting aircraft as ‘Master Pilots.’” He was always proud to have earned the FAA’s Commercial Pilot Certificate, and he led by example through many decades of safe flying. Lester was also an amateur inventor who held a USA patent on a water storage system. After spending their entire lives on rural Long Island, Lester and Jean moved to Georgia about ten years ago, to be closer to family. Lester is survived by his three sons: Randall Hopkins, Lee Charles and Whitney Lane; four grandchildren (Bethany Jean, Amelia Lane, Avery Ayers and Lane Augusta), and one great grandchild (Vivianna Lane). A memorial in honor of Lester and Jean’s lives will be held on a future date to be announced, at the old family homestead at the Lester H. Davis House in Coram, Long Island. In lieu of flowers, the family asks that donations be sent to the Davis Town Meeting House Society, Inc., P.O. Box 4, Coram, New York 11727. 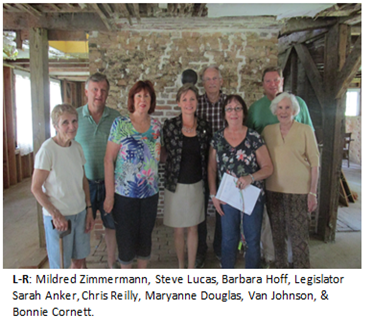 Legislator Sarah Anker with members of the Davis Town Meeting House Society: President Maryanne Douglas, Vice President Suzanne Johnson, Treasurer Chris Reilly, Historian Mildred Zimmermann, Sergeant-at-Arms Jean Hartling, Robert Kessler, Steve Lucas, and Diane Cardello. 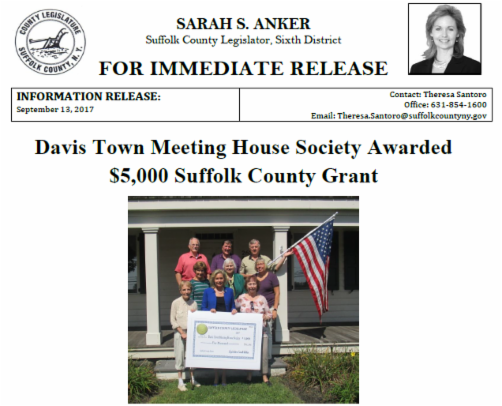 CORAM, NY – On Monday, September 11th, Suffolk County Legislator Sarah Anker awarded the Davis Town Meeting House Society with a $5,000 grant check from the Suffolk County Legislature. The grant is a Suffolk County Legislative Omnibus Grant to assist the organization with community events and programs. 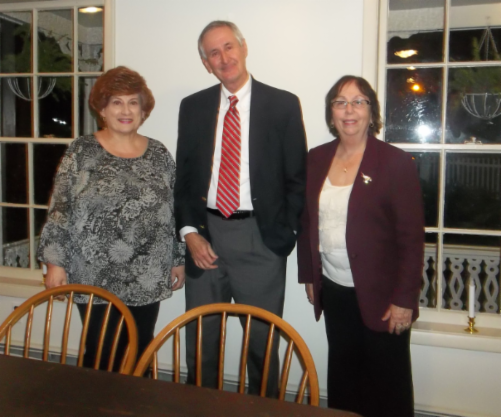 “I am proud to present the Davis Town Meeting House Society with this Legislative Grant from Suffolk County. 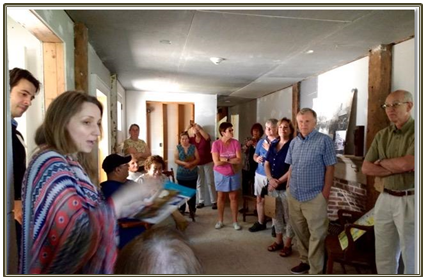 The member of the society do a wonderful job preserving the beauty and integrity of the Davis House, while providing educational programs for residents,” said Legislator Anker. 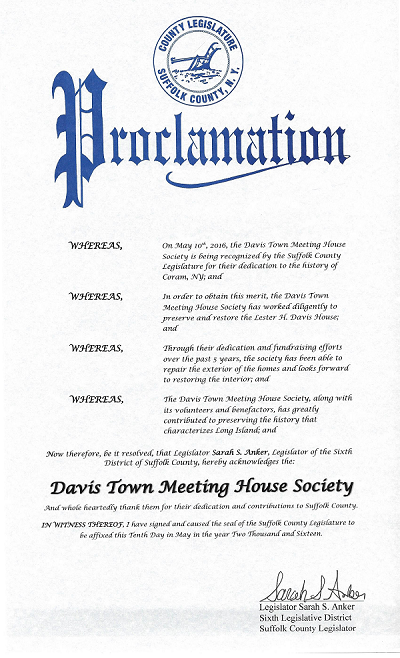 “I look forward to continuing to partner with the organization and its members to improve the quality of life in our community.” The members of the Davis Town Meeting House Society are the stewards of the Lester H. Davis House, located at the corner of Mt. Sinai Coram Road and Middle Country Road in Coram. 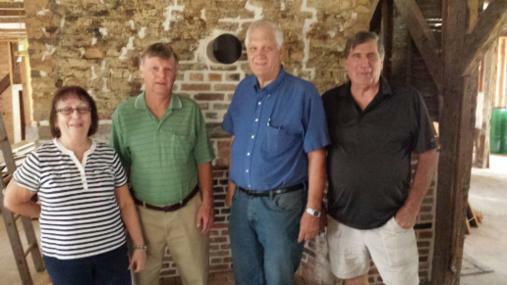 They work diligently to restore and preserve the structure, while providing programs that inform residents about the history of the Longwood community. All residents are welcome to attend upcoming meetings and historical presentations. You do not have to be a member to participate! 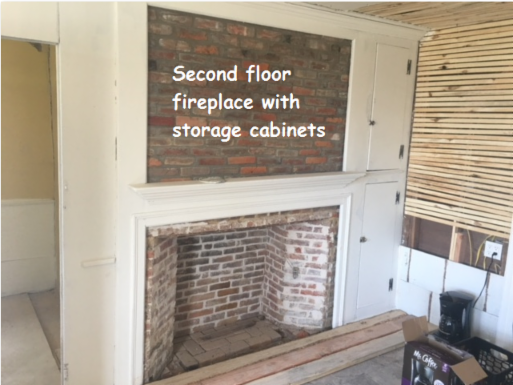 Schedule of Upcoming Events (all presentations will be at 7:00 PM at the Swezey-Avey House at the corner of Yaphank-Middle Island Road and Main Street in Yaphank): October 2nd – “George Washington’s L.I. Spy Ring” by Elizabeth Kahn Kaplan November 6th – “Midnight Rum: L.I. and Prohibition” by Jonathan Olly, Ph.D. December 4th – “Camp Upton” by Paul Infranco & Annual Holiday Party The Davis Town Meeting House Society is also in the midst of their annual membership drive. For more information about the organization, to volunteer, or to receive a membership application, please visit http://www.davistownmeetinghouse.org. Davis Town Meeting House Society receives Proclamation from Suffolk County Legislator Sarah Anker! Davis Town Meeting House Society president Maryanne Douglas accepting the Suffolk County Proclamation for all DTMHS members from Legislator Sarah Anker. SC Legislator Sarah Anker, Maryanne Douglas, Barbara Hoff, & Steve Lucas. Jean Hartling, & Diane Cardello. 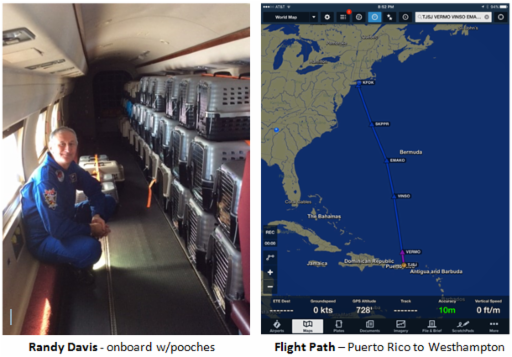 Our very own Randy Davis, son of Lester H. Davis III, helps "Puerto Rico’s Pooches Jet Off to the Hamptons"
from when he flew two-seaters in and out of the old Coram Airport! NYS Assemblyman Steve Englebright announces the securement of $125,000 in capital funding for the interior restoration of the Davis Town Meeting House! 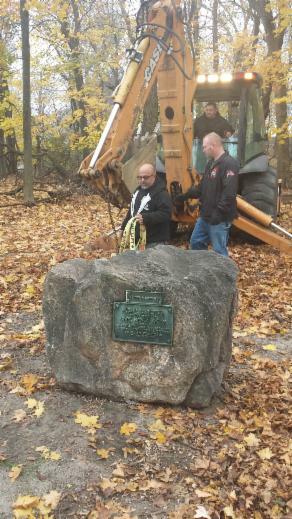 The stone monument commemorating the Coram Community Club was moved from its location at 33 Old Middle Country Road to the grounds of the Davis Town Meeting House through the courtesy of the Supervisor Ed Romaine and Town Parks Commissioner Ed Morris of the Town Of Brookhaven. For historical info, click on Coram Community Club. NYS Assemblyman Steve Englebright visits the Davis House and offers his help! 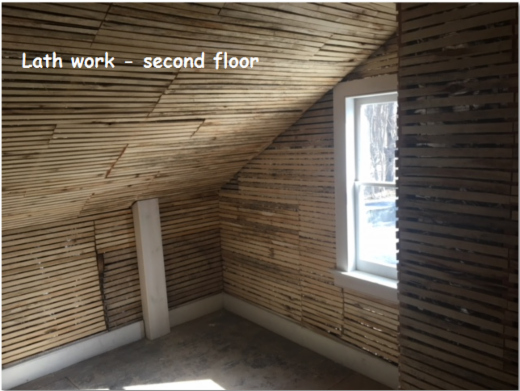 in a combined effort to begin extensive work on the interior of the house. 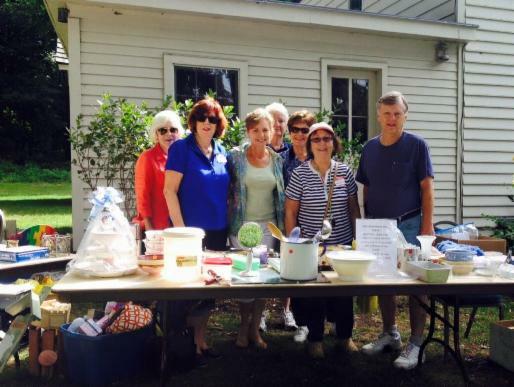 Town Councilwoman Connie Kepert (4th District) visits and supports the Davis Town Meeting House society, Inc. 3rd Annual Yard Sale & Craft Fair held on Saturday, September 12th at the Lester H. Davis House in Coram. 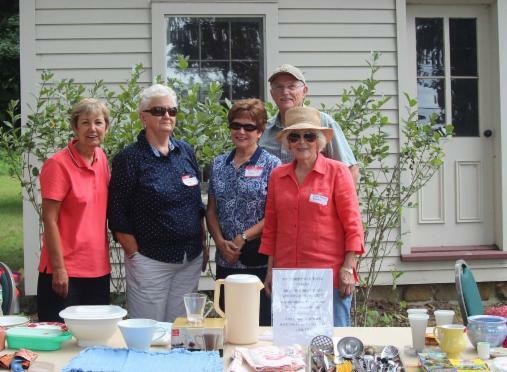 (L-R) Councilwoman Connie Kepert (D-D4), and members of the Davis Town Meeting House Society, Inc. Vana McClure, Jean Hartling Chris Reilly, and Bonnie Cornett. 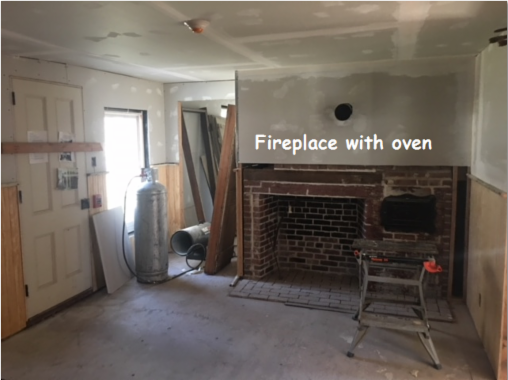 The Davis Town Meeting House Society is an IRS registered 501(c)(3) NYS not-for-profit organization and was formed exclusively to restore and conserve the Lester H. Davis House in Coram, New York. 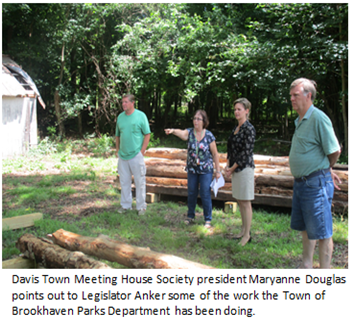 The society works directly with the Town of Brookhaven Department of Parks and Recreation and the Town Historian. 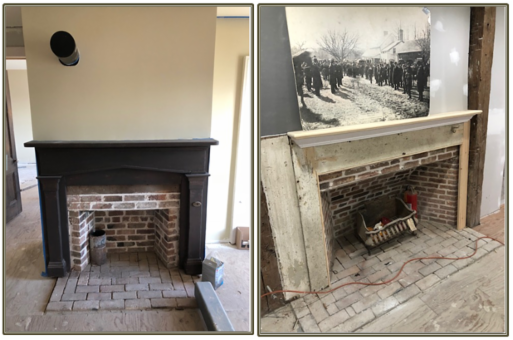 Together, the group works on the historical design of the house, as well as fundraising for the restoration and conservation of the Brookhaven landmark. 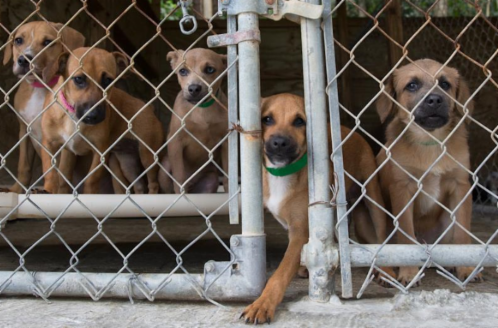 The society welcomes volunteers and donations. Our June General Monthly Meeting was a very special event as we were honored with a visit from Randy Davis, son of Lester H Davis III, visiting from his home in Georgia. Mr. Davis is a board member and a benefactor of the Davis Town Meeting House Society, Inc. Randy is also an entrepreneur and general counsel for the Phoenix Air Group headquartered in Cartersville, Georgia, and an accomplished pilot who helped transport the first Ebola patients out of Liberia to the United States for treatment. 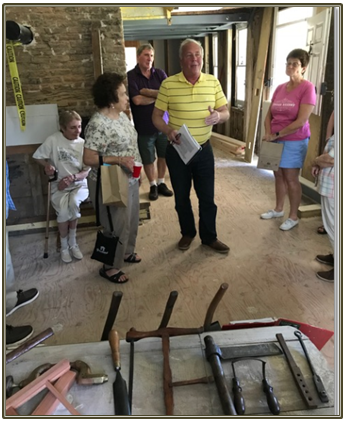 Special thanks to Bob Kessler and the Yaphank Historical Society for hosting our meetings and this wonderful special event at the historic Swezey-Avey House in Yaphank! 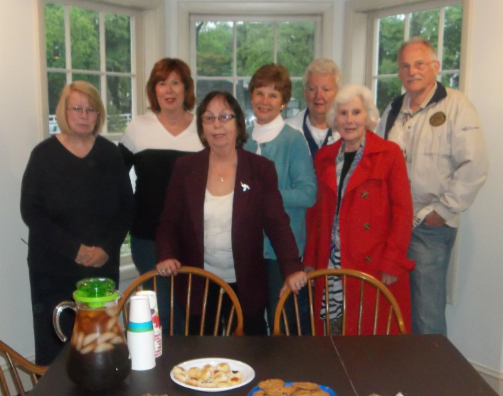 L-R: Erma Gluck, president of the Coram Civic Association, Randy R. Davis, and Maryanne Douglas, president of the Davis Town Meeting House Society, Inc.
L-R: Davis Town Meeting House Society, Inc. members Betsy Bloomer, Barbara Hoff, Maryanne Davis, Jean Hartling, Vana McClure, Bonnie Cornett, and Chris Reilly. Special thanks to Supervisor Romaine as well as to Assemblyman Englebright! The Davis Town Meeting House 'marked' as an historic site of importance! 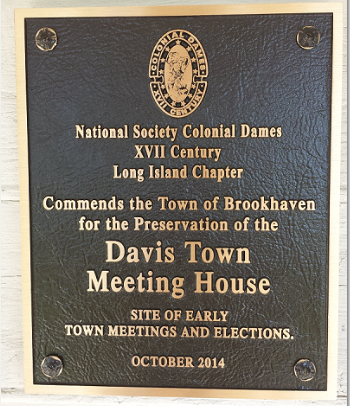 The Long Island Chapter of the National Society Colonial Dames XVII Century 'marked' the Davis Town Meeting House in Coram as a historic site of importance. 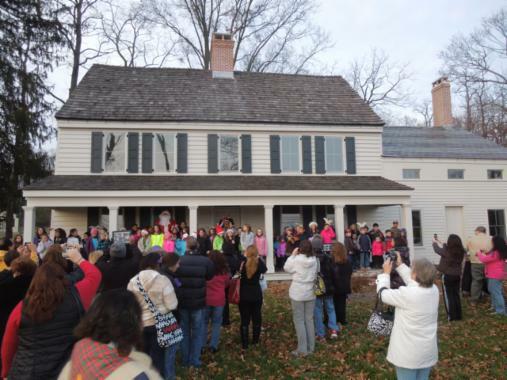 The event was co-hosted by the Colonial Dames and the Davis Town Meeting House Society at the Davis Town Meeting House on the corner of Middle Country Road and Mt. Sinai-Coram Road, Coram. 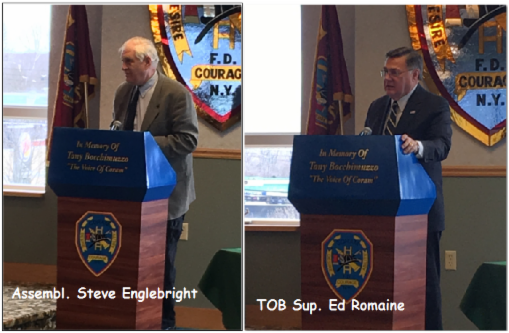 Among those attending the ceremony was NYS Assemblyman District 4 Steve Englebright, NYS Assemblyman Edward Hennessey, County Legislator District 6 Sarah Anker, Brookhaven Town Supervisor Ed Romaine, Town Councilwoman District 2 Jane Bonner and Town Councilwoman District 4 Connie Kepert. (L-R) Councilwoman Connie Kepert (D-D4) and members of the Thee Island Inn in front of the Lester H. Davis House in Coram. For more than two decades, Thee Island INN Soup Kitchen has provided hot, nutritious meals to local residents. Run entirely by dedicated volunteers, meals are served at Thee Island INN every Wednesday and Thursday evening in a small building behind the United Church of Christ in Middle Island. In addition to meals, other goods and services offered at Thee Island INN include food baskets during the holidays and free basic necessities for guests, including clothing, toiletry items and small household items. 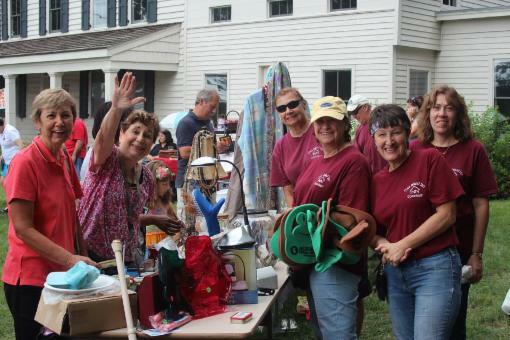 County Legislator Sarah Anker (D-6th Leg Dist) visits the 3rd Annual Yard Sale & Craft Fair at the Lester H. Davis House sponsored by the Davis Town Meeting House Society, Inc.
(L-R) Bonnie Cornett, Barbara Hoff, Legislator Sarah Anker (D-6th Leg Dist), Vana McClure, Jean Hartling, Maryanne Douglas-President of the Davis Town Meeting House Society, Inc. and Steve Lucas. 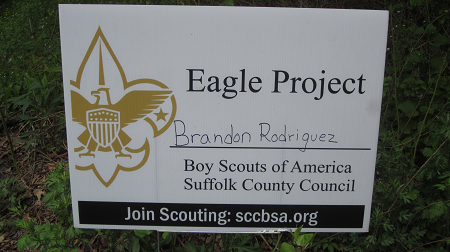 June 2, 2013: Brandon Rodriguez from BSA Troop 64 has begin the renovation work on the Davis Familoy Cemetery as part of his Eagle Scout project. Pictured below is Brandon (center) along with his Troop 64 supporters including Ida Brownley (5th from L), BSA scout leader. 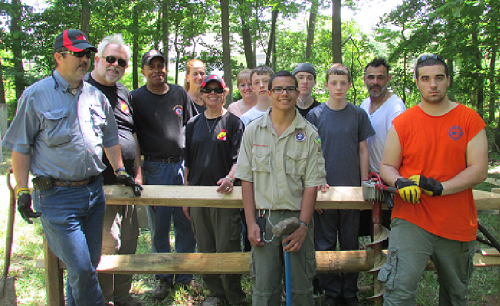 Kudos to Brandon Rodriguez from BSA Troop 64 for taking on the clean-up of the Davis Family Cemetery as his Eagle Scout Project! 1. The committee reviewed and edited the submitted Bylaws for the Davis Town Meeting House Society, Inc. This not-for-profit entity is currently under approval review by the NYS Department of Corporations. Final edits of the Bylaws will take place based on NYS approval of the NFP corporation submission. 2. We agreed to have a vote for the officers of the new corporation. The committee members are creating the nominations for the slate which will be voted on at our next meeting on June 7th. 3. Committee representatives are meeting with TOB Supervisor Ed Romaine on May 9th. 4. 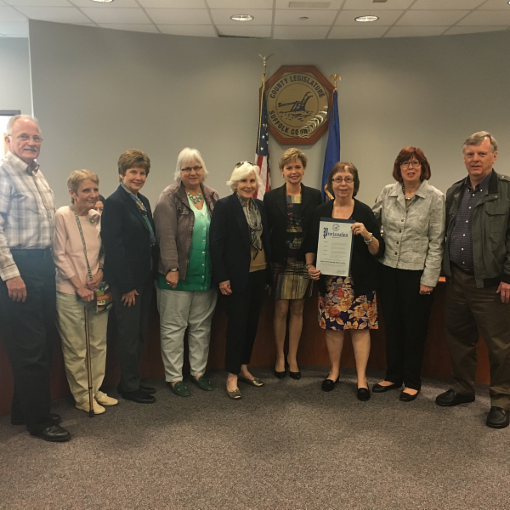 Committee representatives are meeting with TOB Councilperson Connie Kepert on June 3rd. Under the new redistricting plan, the location of the Davis Town Meeting House is now in Connie Kepert's District 4 (previously was in Jane Bonner's District 2). 5. Ida Brownley, leader of BSA Troop 64, has confirmed that the cleanup of the Davis Family Cemetery is now an offical Eagle Scout Project. 6. Randy Davis, son of the Lester H. Davis III (last owner of the Davis House) and a founding member of the Davis Town Meeting House Committee has volunteered his pro bono services as an attorney to work on the 501(c)(3) submission to the IRS upon our successful receipt of the NYS NFP incorporation. 7. Next meeting is June 7th at 7:00 pm at the Longwood Public Library. 1. All funds from Town Resolution #2009-752 for exterior restoration and interior structural work have been exhausted. 2. We do have funds remaining to complete the interior designs. 3. No additional grant monies have been secured by the Town as of this date. 4. Fire alarms are installed. 5. Exterior spotlights will be installed during March. 6. Replacement Historic Sign Marker is complete and the Davis Town Meeting House larger sign is being worked on. Installation in March or April. 7. BSA Troop 64 will restore the cemetery and the Town will provide for the dumpster as well as a fence surrounding the cemetery. 8. Abandoned one bedroom house by cemetery as well as two outbuildings by the Davis House will be removed in the near future. 9. 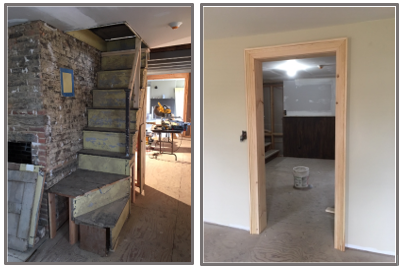 As previously mentioned, completion of the interior of the Davis Town Meeting House is a multi-year project due to the magnitude of the effort as well as the cost. December 7, 2012: Boy Scout Troop 64 will be submitting plans to the Davis Town House Restoration Committee for the restoration of the Davis Family Cemetery as part of an Eagle Scout project. The cemetery is located on the property. Plans are proceeding well for the design of the interior of the house. This will be a multi-year project due to the magnitude and cost of the work. Next meeting of the Davis Town Meeting House Restoration Committee will be in January; date to be announced. For inquiries and observations, please send an email to info@davistownmeetinghouse.org. December 2, 2012: The Coram Civic Annual Holiday Party was another huge success enjoyed by young and old alike. The party culminated with the traditional lighting of the Christmas Tree and this year all of the kids were able to join Santa Claus on the porch of the newly renovated Davis town Meeting House! 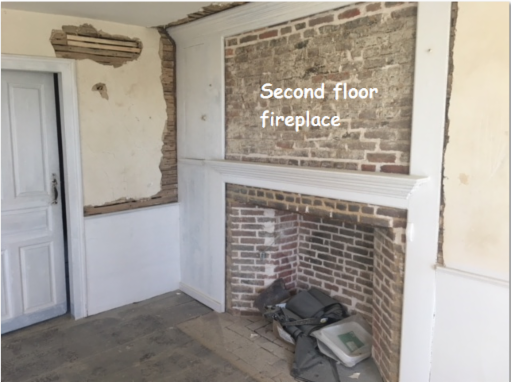 November 26, 2012: Interior schematics have been given to the committee and will be reviewed at the next meeting of the Davis House Restoration Committee to be held at the Longwood Public Library 2nd floor meeting room on Friday, December 7 at 7:00 pm. All are welcome. October 25, 2012: Shutters are on! The shutters are now up on the front of the original portion of the house. Note the hinges on the side of the shutters nearest the windows. 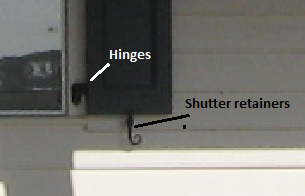 Shutter retainers hold the shutters open or when turned, allow them to be closed. 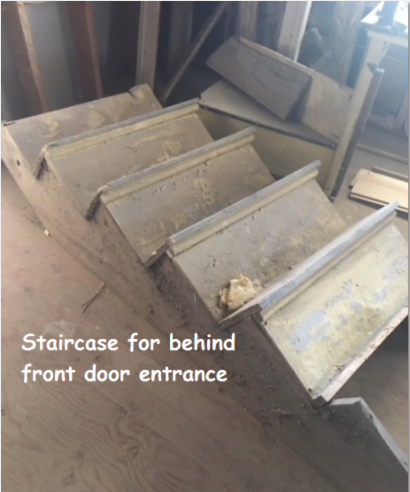 October 2012: Maryanne Douglas and the Davis House Restoration Committee report that the window shutters have arrived and will be installed as soon as the hardware is delivered. The Committee is waiting on the floor plans from the architect and then will begin the interior design. 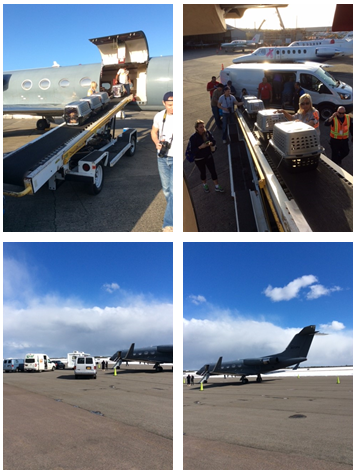 Congratulations to Maryanne and the Davis House Team for their incredible efforts!